Pork loin roast is a large cut of meat taken from near the top portion of the rib area, and it is generally considered to be one of the best cuts of pork for roasting because of its fat and moisture content. Before roasting the pork loin on the grill, it is essential that you allow the meat to warm up to room temperature to avoid drying the pork loin roast out as the cold surface warms up on the grill. Preheat a gas or charcoal grill to 350 degrees Fahrenheit. Rub the pork loin with vegetable oil to just lightly coat the outside. Season the meat with the paprika, garlic salt, onion salt and freshly ground black pepper, rubbing it into the meat evenly over all sides. Place the pork loin on a sheet of tin foil and gently wrap the tin foil around the whole pork loin roast. Put the pork loin roast on the grill over direct heat. Cover the grill and allow it to cook for 15 minutes. Flip the pork loin roast over using heavy oven gloves and cook it for an additional 15 minutes on the other side over direct heat. Move the pork loin roast to the side of the grill and cook it for an additional 30 minutes. Flip the pork loin roast over and cook it for 30 to 35 minutes on the other side. Unwrap the pork loin roast and check the internal temperature at the centermost point with an instant-read thermometer. When the meat is cooked to 130 degrees, it is medium rare. For more well done meat, cook the pork loin roast to 140 to 145 degrees before taking it off the grill. Remove the pork loin roast from the grill and allow it to rest for 30 minutes before slicing or serving it whole. 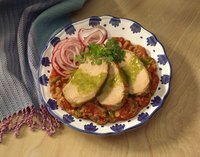 Chili powder, cumin and ground coriander are commonly used to season pork loin roast to taste. Use these spices sparingly if you are unsure of how much to use.